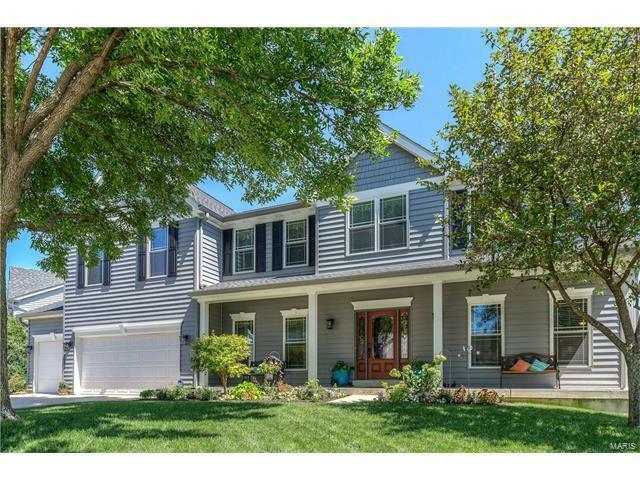 METICULOUSLY MAINTAINED 4 bed, 2.5 bath two story over 3,500 SF! Original owners, lovingly cared for home- absolutely turn key ready! Too many upgrades to list, but we'll try. Gorgeous front door w/sidelights. Sparkling wood floors from foyer into brkfst room & kitchen. 9 ft ceilings on main. Kitchen boasts 42 in crowned cabinets. Quartz (Cambria) counters with under-mount sinks. Appliances all upgraded. Extended bays in brkfst and family room. Top tier carpeting and pad installed. Custom paint colors thru/out. Polished travertine in upper baths. Lighting/fans/switches & door hardware upgraded. Newer dual zoned HVAC and water heater. Garage doors and openers replaced - insulated garage. Newer architectural roof, INSULATED VINYL SIDING w/new soffit/fascia/gutters. Low-E, double hung prairie grid windows. Walkout L/L has rough in & full laundry hookup. Beautiful deck. Irrigation system, professionally maintained trees. RARE OPPORTUNITY to own a true GEM. Luxury, and comfort await you! Elementary school: Progress South Elem. I-70 toward O'Fallon, take T R Hughes Rd/Belleau Creek Rd Exit, Left on T R Hughes Blvd (Signs for Belleau Creek Rd), Continue onto Knaust Rd, Turn Right onto Abington Dr., Home is on the Left.